As noted above, HIT and HIE provides an infrastructure for the Bangor Beacon Community (and Pioneer ACO) to meet its goals -- the ability to exchange information is instrumental for improving care coordination. At the heart of the technical infrastructure of the Bangor Beacon Community (Figure J-3) is the HIN.9 HIN is an independent, non-profit organization that was established as the HIE for the State of Maine in 2006. 2012 Annual Report Bangor Beacon Community. All 38 of Maine's acute care hospitals are under contract to connect to the HIE. HIN has 34 of the 38 hospitals connected, 376 ambulatory provider sites including primary and specialty care practices, FQHCs, mental health agencies, home health and two long-term care providers. Throughout 2013, HIN will work to establish connections with the four remaining hospitals and expand the types of data shared by hospitals that are already connected. It will also continue to connect new ambulatory sites. HIN maintains medical information on more than 1.1 million patients or 76% of all of the residents in the State of Maine. 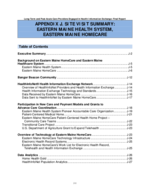 Maine is an opt-out, consent model state meaning patient information is automatically included in the HIE unless the patient opts-out of participation in the exchange. 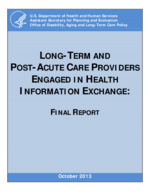 During interviews, HIN Executive Director, Dev Culver, reported that 70% of the patients who participate in the statewide exchange have health information posted from one or more non-affiliated providers. Problem list (conditions, diagnosis and/or health problems from participating providers). Certain classes of information are not included on the HIE including information from substance abuse or mental health providers and HIV diagnoses and results of HIV tests. 12. About HealthInfoNet Better. Easier.Safer pamphlet. HIN allows providers to identify with or link to a patient. Once they are linked HIN is able to push event and documentation notifications to the provider. There are currently six "notifiable" events and this list is expected to grow. There is a near real-time monitoring that can occur which has the potential to improve communication, efficiency and effectiveness particularly for care management. HIN is also emerging as middleware allowing a provider or a user to specify information they would like to receive on a patient. HIN routes (or pushes) the information to a reconciliation cue at which point the receiver reviews and decides whether to incorporate the data/document into their EHR. Issues are emerging with this practice including the potential to overwhelm the user with too much information to review and reconcile. 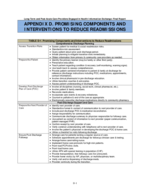 Figure J-4 provides an illustration of HIN's technical architecture. 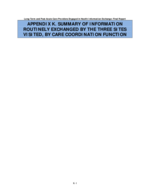 Information is exchanged using a variety of standards including Health Level 7 (HL7) version 2.x for messaging and clinical document architecture (CDA) and continuity of care document (CCD) for document exchange. Table J-4 summarizes the information exchanged and HIT standard used by HIN and EMHS's ability to support the standards. Messaging HL7 Version 2.x. Supporting ADT messages. Labs HL7 Version 2.7 (may receive in other HL7 versions, but converts to 2.7). Supporting lab standards. 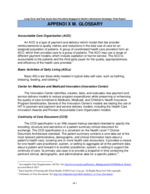 Documents HL7 2.3x to 2.5x--HIN may receive document data. HL7 CDA--The content sent in the wrapper is good, but data in the document requires clean up because it is not standardized. HL7 CCD--HIN is experiencing problems with this standard. Every vendor has implemented it differently. HIN will take the CCD if they can parse out the data. The home care POC & other documents are sent using HL7 a results message. The content of sent as a text blob. Application versions used by EMHS currently do not have the capability to support a CDA. Next version of EMHC EHR may include CCD, but it has not been installed at this time. Medications RxNorm or NDC codes. NCPDP used for communication standard. Not applicable. As a user requests a look up of the medication history, HIN queries the medication database from SureScripts & the Maine Medicaid database for the latest information. 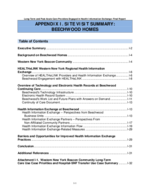 HIN has a Home Care and Hospice Data View, which presents summary of care document information sent by the EMHC EHR. 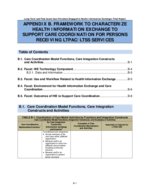 The summary of care document includes medication and laboratory data from the home care POC. There are two other HHAs and two SNFs participating on HIN. They have access to HIN data and send ADT alerts and diagnoses for the problem list. During interviews with HIN, opportunities for submitting other home care information were discussed including submitting the Outcome and Information Assessment Set (OASIS) and minimum data set (MDS) patient assessment summary. 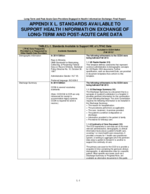 Information was provided on Keystone HIE pilot study in Danville, Pennsylvania and references available on the standards and interoperability (S&I) Framework Longitudinal Coordination of Care (LCC) wiki. Tools are available for a HIE organization and LTPAC provider to send the OASIS and MDS in the CMS format, have it transformed into a CCD and sent to HIN. 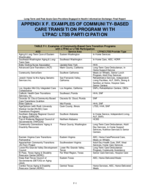 Also discussed was a new opportunity to test the S&I Framework LCC initiative to exchange a home care POC using the HL7 Consolidated CDA standard. HIN creates and manages all user accounts for providers/caregivers who have access to the exchange. 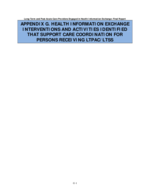 The exchange maintains five roles for use access that define the scope and nature of an individual user's access to patient identified clinical data. Employers, insurance companies, and the government cannot access patient information at this time. After a user has been "authorized" by HIN, they are sent a secure login and required to change their password immediately. Passwords must be unique and can only be reset by authorized personnel who can verify the user's identity.13 HIN maintains audit reports to keep track of who views the records in the exchange. At the time of the site visit, patients did not yet have online access to their health information on HIN. 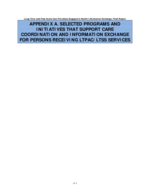 However, they may request a printed or CCD copy of their HIN record through their provider and/or request an audit from HIN on who has accessed their medical information through the exchange. HIN provides EMHS with the technical tools to coordinate care using HIE and secure e-mail messaging. The availability of technical tools to support care management across different types of provider organizations and health systems is instrumental for EMHS to test and deploy new care and payment models in accountable care and medical homes.